One of the many benefits of publishing PorschePurist is that we sometimes get a first look at various Porsche related products. A few weeks ago, Griot's Garage (a PorschePurist sponsor at the time) sent us a bottle of their new Heavy Duty Wheel Cleaner to try out prior to it hitting the market. While we were happy to try it, the weather wasn't very cooperative and then once it was, we procrastinated a bit. I mean let's face it, for most of us, cleaning the wheels on our Porsches just isn't that much fun. It's necessary. It can be satisfying if they're especially dirty, but fun? Nope! The good news is, with this new Griot's product it just got a whole lot easier. We've tried a number of different wheel cleaners over the years and spent considerable time and money doing so. When we received the Heavy-Duty Wheel Cleaner from Griot's, I was interested, but didn't expect much. After all, it's just a wheel cleaner, right? We had about 3 weeks of rain here at the lake, so the 993 hadn't seen any real use for close to a month. Once the weather finally cleared John and I went for a number of "spirited" drives along the coast of Maine enjoying the 993 and the scenery. 500 miles of hard braking later, we had built up quite a coating of brake dust on our 18" Turbo Twists. While the picture above doesn't really capture it, the brake dust was thick and hard inside the wheel. Following the directions that came with the cleaner I rinsed the wheels first with water. Once done, I sprayed the cleaner directly onto the wet wheel. It was at this point that I noticed the first difference with the Griot's product. Not only was it going on thick and sticking to the wheel (see picture above), it didn't smell caustic (a lot of other cleaners we've tried make it hard to breathe just being in their presence); this was a very pleasant surprise. After letting the cleaner sit for about three (3) minutes you could notice the cleaner changing to a pinkish/red hue. This color change lets you know the product is working and in fact, at this point, a considerable amount of brake dust was already washing away of its own accord. I would think, that for wheels with light brake dust, you could simply rinse them at this point with a high power spray and most of it would come off. However, Griot's doesn't recommend that and our wheels had heavy, heavy dirt/dust so we needed to srub a bit with a brush (you can use a rag if you like, but a simple, inexpensive wheel scrubber brush makes the job much easier, especially in those hard to reach places). I spent less than one minute on each wheel (not including elapsed time as the product works) between wetting, applying and scrubbing. The end result, was one of the cleanest wheels I've had in a while. There are other wheel cleaners out their that work in a similar fashion to the Griot's formula, but most are corrosive and caustic with a higher price point: Griot's product is only $16.95 for a 35 ounce bottle and $49.99 for a whole gallon of the stuff . With these results, it's pretty simple to recommend Griot's Garage Heavy Duty Wheel Cleaner. You can purchase on Amazon. Remember, and this is my only complaint, if you buy the 35oz bottle, it doesn't come with the sprayer . You'll need to buy that separately. However, the sprayer is cheap, durable and reusable (or, simply use one you have lying around from another product, just be sure to rinse it thoroughly first). Have You Ever Heard of an Emerging Speedster? Can You Go Camping in a Porsche 993? How do you think this will work on some cookie cutter wheels on an 83 944? On my 944 the wheels are pretty dirty with brake dust and nothing seems to get all of it off. 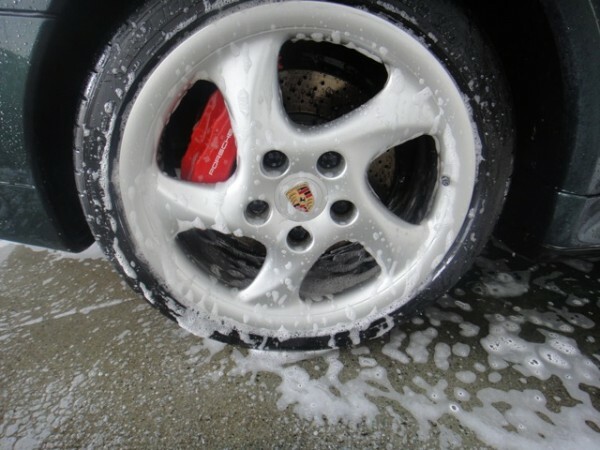 We haven’t tried it on a wheel with real bad, long term brake dust (our Porsches get cleaned too frequently). However, we have read a few other reviews that all had very positive results. It’s possible it might take a second application and/or some heavy agitation, but it should get it clean. How does this product compare to P21S Wheel Cleaner? I have enjoyed great results with P21S on the wheels of my 944 and BMW alike. However, the price is 90 bucks for 5 liters of the stuff. At $18/liter, I think I’ll try Griot’s product at ~$13/liter. It works in a similar fashion. The Griot’s seems to be a bit thicker in that it sticks to the wheel a bit better. To me, that means less product, less money and better cleaning. Combine that with the price point and it seems like a win. I’m sorry you didn’t find our review to be useful and felt it only to be an “infomercial”. As the tag-line of our site says, we’re all about “The Cars, PRODUCTS and Lifestyle” associated with the Porsche brand. In fact, I think we are one of those sites you mentioned that are specifically designed for that purpose of providing this type of information. As a result, from time to time we do, and will continue to, review products. Yes, sometimes those reviews are about products from companies that sponsor our site, but we’re always upfront about that in our write-up and our reviews are always objective (if we find a fault, we’ll be the first to point it out). Thanks again for reading and remember, PorschePurist.com is free and electronic. If you don’t happen to like a particular post you can always delete it until the next one comes along. If you feel strongly enough, while we would hate to see you go, you can always unsubscribe. We sure hope you decide to stick around! PS. We moved this thread to the proper post as the original comments were on the video post about the new 991 and some might find that confusing. I like having product reviews. I would rather know something works well before spending my hard earned money for it. I really value your product reviews. It is a very good resource and one of the first places I look when I have a question or problem. Keep up the good work! I agree with David. Product review is helpful with so many products available. Trying each one until you find one you like is not only exsensive but very time consuming. Keep up the good work.